Yesterday Long Suffering Spouse and her junior high students went on a leadership training workshop in Wisconsin. Leadership training, it seems, involves climbing towers and tire swings suspended high in the trees and games involving broomsticks and pulling mats out from beneath the feet of an entire group. Long Suffering Spouse brought home pictures, which of course I can't share with you lest our secret identities be compromised: To me, though, the pictures looked like the inside of the Lincoln Park Ape House. Only the visitors were on the wrong side of the glass. If this is really how leaders are trained, perhaps we may finally have an explanation for the current Wall Street meltdown. Finally, though, the ordeal was over, or so Long Suffering Spouse thought. The yellow school buses returned (a couple of hours ahead of schedule since all these future leaders were soaked to the bone) and the group was conveyed to a nearby Culver's restaurant. While there are a few Culver's restaurants in the Chicago area, Culver's is really some sort of Wisconsin institution. The principal attraction at Culver's is the butter burger. Just in case the cholesterol in the meat itself is insufficient to cause arterial blockage, the bun, and perhaps the burger, too, are soaked in butter. (They're actually quite good, I hasten to add.) Then, while you're waiting to schedule your bypass surgery, you can treat yourself to a frozen custard dessert. But it was neither the butter burgers nor the custard that caused problems for Long Suffering Spouse yesterday: It was the free refills of Coke. Apparently some of the young scholars did not take into account that it would be a long journey back from southern Wisconsin to the Northwest Side of Chicago and that yellow school buses are notoriously deficient in the bathroom department. Only a little while after the bus caravan set out for Chicago, while the buses were rolling through a rural landscape undisturbed by stores or gas stations or other buildings that might have restroom facilities, a couple of the kids began urgently requesting an emergency stop. A stop was made. The snickering and giggling was brought under control and the buses started again on their homeward journey -- only to be interrupted by another's plaintive cries. There was yet another stop. Wisconsin sweet corn may not be as sweet as usual this year. I'm not sure where it was in the course of this epic voyage that still another kid threw up. But someone did, and Long Suffering Spouse was given the unhappy task of cleaning it up. I heard about all of this almost in real time because Long Suffering Spouse was calling me from the bus periodically for updates on yesterday's Sox game. The Northwest Side of Chicago may not be the heart of Cub Country, but it is at least the small intestines or liver or some other vital organ. However, Long Suffering Spouse and I are White Sox fans. Usually we coexist peacefully enough with our Cub fan neighbors. Real baseball fans -- even die-hard Cub fans (and, yes, there are some people who are both) -- are pleasant enough, even after we establish that we disagree on fundamentals. It's the casual fans -- the bandwagon jumpers -- who are so obnoxious. And, oh my, there are a lot of them this year. They are particularly abundant in the junior high. Only Long Suffering Spouse and one other teacher are Sox fans among the junior high faculty at her school. They are a persecuted minority, particularly at this moment when the Cubs are burdened with such great expectations and the Sox have won (by virtue of the outcome of last night's game) only the right to face the Twins tonight in a one game playoff. Long Suffering Spouse would holler the score to her colleague, but it was difficult to be heard over the high-pitched cries of "I hope they lose!" or "Sox stink!" But, eventually, Long Suffering Spouse returned home safely. She also returned cold, wet, and slightly deaf. She is back facing America's Future Leaders at this moment. It's time once again for Heads or Tails, that weekly cultural enterprise brought to you each Tuesday by Barb, of all things Skittles. I cheated this week and looked at Barb's entry first -- and, sure enough, she'd put up a video of K.C. & the Sunshine Band doing "Shake, Shake, Shake (Shake Your Booty)." Well, that was certainly appropriate. And it inspired me to search for a video of my own. I recalled that The Swinging Blue Jeans had a big hit with "Hippy Hippy Shake," and I went in search of a video. I found this one instead. No, the Curmudgeon is not getting braces: I had my turn with those contraptions several decades ago. But Youngest Son is still under the care of an orthodontist. His braces were recently removed and he had an appointment today to check on how his retainer was retaining. Scheduling these appointments are... tricky. While most kids would gladly sacrifice class time to go see the orthodontist, their parents are usually less willing. So everyone tries to get these appointments for some time after school or on school holidays. Our orthodontist puts his foot down occasionally because he can't see 500 kids between 3:00 and 3:30 every day. He insists that some appointments (and he specifies which) must be done during the school day. Today's appointment for Youngest Son was set for after school, but just at the outset of the daily rush because, on Mondays, he gets out at 2:15. But Youngest Son also has football practice after school. There's a window between the end of school and before practice starts. That's the time when he gets his homework done. Sometimes, or so he tells us, that's when he seeks help from the Geometry teacher or the Chemistry teacher. But today Youngest Son was willing to sacrifice this precious time to get to and from the orthodontist. As long as he got back in time for practice, of course. He was seemingly pleasant about it. But, if the appointment went long... well, the mask would drop. You have already surmised, from the title of this essay, that yours truly was somehow commandeered into conveying Youngest Son to his appointment and back to practice. See, Long Suffering Spouse found out that she would be spending the day in Wisconsin at some sort of a leadership training seminar for her junior high students. In Wisconsin, if not everywhere, leadership is built by trudging through the woods and playing games like tug-of-war. For some reason -- perhaps the two hour journey each way in a yellow school bus with shrieking junior high students -- Long Suffering Spouse was not looking forward to the experience. Once the scheduling conflict became clear, Long suffering Spouse began casting about trying to find some way of getting the appointment covered. She looked pointedly in my direction. I tried to look invisible. "Well," said Long Suffering Spouse, "we might be able to get my mother to do it. My 75-year old mother. My mother, who is having increasing difficulty driving...."
These rather one-sided discussions proceeded over the course of several days. Eventually, though, I was shamed into speaking. "Look, it's not that I won't do it. It's just that the quickest way for something to get scheduled for that time is for me to commit to doing this." So the great day arrived. We dropped Long Suffering Spouse off at school well before sunrise. I told her I'd take care of the appointment and not to worry about it. She asked me again to repeat the time of the appointment. And the location. And what time I was to pick up Youngest Son. I got to work early this morning and tried to get a full day's work done in half a day's time. Usually, I seem to get a half day's work done in a full day's time. Sometimes, I'm not even that efficient. But, today, I made a real effort. I even accomplished some of the things I had set out to do... but the morning was waning and the phone was ringing and the time I had hoped to leave by came and went. And then the time by which I had to leave if I had any hope of getting to where I needed to go came... and I went. It was raining, but I made good time. I was no more than five minutes late. OK, 10. But we made it to the orthodontist by 2:30 for our 2:30 appointment. OK, 2:30-ish. One of the things I'd wanted to do today was stop at the bank. There was a branch just down the street from the orthodontist's office. Just down the street... as in literally two blocks. So I dropped Youngest Son off and headed for the bank. I wasn't even out of the car when my cell phone rang. It was Youngest Son. He was done. Wouldn't you think the kid would at least read a magazine for a couple of minutes... just so I could pretend that I hadn't torn apart my entire afternoon for a 30 second appointment? So, yes, Long Suffering Spouse was not looking forward to today's adventure in the woods. I tried to jolly her up all weekend, but her apprehension of today's event loomed over all. She'd actually been to this place in August, for a teachers' only workshop. She was only 60 days out of surgery at the time... and she said she hurt for a week after the event. Walking on the hilly grounds, never able to sit down, took its toll on her. Today, she packed a sandwich, some chips, and lots of Advil. She called me shortly after she arrived. "It's raining," Long Suffering Spouse announced. "And the buses are gone. And there's no place to get out of the rain." "I'm sorry," I said. And I still can't figure out how this builds 'leadership' skills. Clutter in workspace reflects ideology? That's what New York University psychologist John Jost and his colleagues are claiming in a paper to be published in a forthcoming issue of the journal Political Psychology. Jeanna Bryner reports on the study in a September 25 article on LiveScience.com. Apparently, conservatives tend to favor clean, well organized offices and are more "conventional" in decoration. Liberals tend to have more clutter. If clutter is the criterion... I must be a bomb-throwing anarchist: The Undisclosed Location usually looks as if it's just survived a hurricane. And only barely. I never knew.... Or maybe the study is just goofy. Why the Swiss particle accelerator is broken? Reuters reports that the Large Hadron Collider is down for repairs only 10 days after it was started up. The problem seems to be a helium leak -- not, as some had warned, a nascent black hole which will grow and grow and swallow the Earth -- and the most likely cause of the leak appears to be, according to the Reuters story, a "faulty electrical connection between two of the accelerator's giant magnets." Long Suffering Spouse and I are moving into a new phase of social life, I guess. And now a new chapter opens: Recently we received a wedding invitation for one of Younger Daughter's friends. Long Suffering Spouse said we should go. This was no casual acquaintance, filling out the guest list with parents of friends in the hopes of increasing her financial return on the day; this was from Older Daughter's oldest and dearest friend, her BFF (I believe that's the term in the current argot), a friend since early in grammar school. Well, the response card was due in mid-September, so we put it to one side. But where to put it? Not with the bills. It's not a bill, not exactly. And it would seem kind of cold to put it there, anyway. It's not like Long Suffering Spouse and I are awash in social invitations. All those events set out at the top of this essay were w...i...d...e...l...y spaced in time. Eventually, though, Long Suffering Spouse designated a place and I put the invitation there and immediately forgot about it. Until this week. It turns out that wedding invitations are similar to charge card bills: All too often I remember them a few days after they're due. 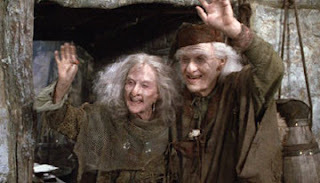 We didn't miss the wedding -- Long Suffering Spouse has it on her calendar, and I am dimly aware that it's still somewhere in the future -- but we were late returning the card. The bride-to-be still has family at the school where Long Suffering Spouse teaches and the bride's mother buttonholed my wife earlier in the week to inquire if we were planning to attend. Oooops. Well, Long Suffering Spouse apologized profusely and said we were looking forward to it and, that night, we began our search for the long-forgotten invitation. But this is not just about sports. In fact, it's more about the differences between fans and players. If it weren't for the fact that I've had children who've participated in sports, I'd think that the players would be feeling the same way I am -- only magnified immensely. I'd have scoffed at the newspaper reports this morning of Ozzie Guillen playing golf on yesterday's off day, bad boy catcher A.J. Pierzynski going bear hunting, other players going off to hunt deer. I'd think that improbable macho bluster. And maybe some of the players did fib about their whereabouts and actually hid out in their Minneapolis hotel rooms fighting nausea. Players at any competitive level can't bring the nerves on the field with them. Not unless they have mastered them, and are using them. Oh, sure, failure happens. The Sox may blow their slim 2½ game lead. Then again, they can clinch the Division title (and the last AL playoff spot) by sweeping los Piranhas. But it won't be from nerves. Kids somehow learn, at an early age, to get past the butterflies or they stop playing. And major league ballplayers are just men playing a kids' game. For lots of money. 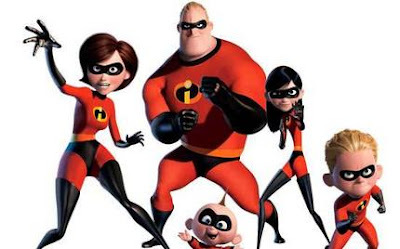 When I get to a park district game or a high school game I always can identify the parents of the kid who is pitching. It's the way they pace. Or can't pace. The way they move on every single pitch. More than once, I've gone up to the mom or dad and told them, "It's harder on us than it is for them." I've come to know it's true. It's really pretty amazing, isn't it? Heads or Tails #57 -- How would you change where you live? Welcome once again to Heads or Tails, the meme brought to you each Tuesday by Barb, of all things Skittles. This is week number 57 for HoT and so, for variety's sake (get it?) our stern taskmistress has called "Tails." Participants are obliged to write about how they would change where they live. I know what you want, Barb: You want me to say that I'd want my mortgage paid and a new roof and (as long as we're wishing) a new furnace, too. All of which is true. But I choose to go in a different direction. Now I'm not saying that this is the precise neighborhood to which I'd relocate tomorrow, if given the chance, but, yes, I'd like to live on the Moon. I should be fretting about how my yet unborn grandchildren will fare growing up in the newly developing colonies on Mars or in the Asteroid Belt. I was all set to come out swinging this morning, about greed and bailouts and the cheaters who have prospered and will prosper from this latest and greatest round of corporate welfare. I was going to rail about the ways in which cheating has become pervasive, even acceptable, in our society. I had Long Suffering Spouse in mind: A grade school teacher, she has to be constantly vigilant in her classroom because kids cheat all the time. It's not just cheating on tests... one or two kids tried that even back in my day... but kids now cheat when correcting their homework, apparently just to stay in practice. And it's not one or two "bad kids" who cheat... these days, bad students cheat, good students cheat, even honor students cheat. And then I thought a little more about why I'm so angry about this bailout business. You know, as a society, we do kind of admire cheaters. Gaylord Perry is in the Hall of Fame. Mark McGwire and Sammy Sosa may not get in... not for a long while... but that's because they [allegedly] cheated using drugs. Our [official] societal disapproval of drug use trumps, in that instance, our admiration of successful cheating. So I continued to ponder: What is it about this instance or corporate cheating run amuck that has me (and a lot of other folks, too, I think) so angry? Continuing the baseball analogy (sorry, Bee), a few years back, when Sammy Sosa's bat shattered and the cork sprayed out, the umpires threw Sosa out of the game. He was punished with a suspension as well. Now, though, the Wall Street greedmeisters, and more particularly the mortgage lenders, have been caught cheating in lending money to people who couldn't possibly qualify for loans, in making fraudulent loans, in accepting kited appraisals... and the umpires aren't throwing them out of the game. They're getting the bankers new bats instead. When you cheat, you run a risk of getting caught. As much as we may have a cockeyed admiration for the successful cheater, we also expect that when a cheater gets caught, there will be punishment. The bankers cheated and got caught: The real estate market bubble burst and all their shaky loans have collapsed. But no one's talking about kicking the cheaters out of the game. No one's talking about punishment. Of all the blogs I look at every day, I was most surprised to see Second City Cop commemorate Talk Like a Pirate Day. I remembered that I'd mentioned this last year -- so I looked back at my posts from that day and realized... I got a lot of comments just for mentioning the stupid thing. So maybe it will happen again. If you remember what a CB radio is, write a post about it on October 4 and send me a link. I'll put up the links on 10/4. Arrr, cb Day is comin' 10/4 good matey Gar, Where can I find a bottle o'rum? Before Talk Like a Pirate Day is over, methinks I'll be needin' some rum meself! I didn't actually take an entire day off whilst recently battling the plague (I'm finally getting better, though, and thanks for asking) but I did come home early several days in a row, often even before Long Suffering Spouse got home from her teaching job at the neighborhood Catholic school. Weak as I was, therefore, I still had an awesome power: I could watch anything I wanted on TV. Unfortunately, what was true of Daytime TV when I was younger remains equally, and painfully, true today: There's nothing on. There are simply more channels. So I toyed with the idea of picking out a video to watch. When the kids were little, bringing home germs that felled all of us, we would hunker down to watch movies together. These the kids picked out. When you're sick at home movies are comfort food for the soul -- as important to feeling better as cough syrup and nearly as important as chicken soup. 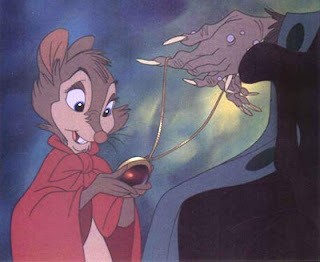 With Older Daughter, it was The Secret of NIHM, a Don Bluth movie about intelligent mice. And rats. It was a sweet little movie... that eventually wore out its welcome after (seemingly) endless repetition. With Younger Daughter, it was Disney's Fantasia. This troubled me... but only because I thought of it as a movie that people never watched unless they were stoned. What can I say? The 70s warped a lot of us. There were other favorites, of course. The kids made an important distinction between their Robin Hood (the Disney cartoon, at left) and my Robin Hood... with Errol Flynn, Basil Rathbone and Claude Rains. So, naturally, when the kids were little and we debated which movie to put on, the Disney version won out almost every time. Times change (thankfully, in this case). 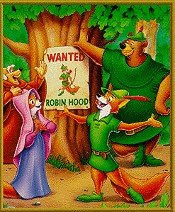 Now the kids and I both enjoy Mel Brooks' Robin Hood: Men in Tights. 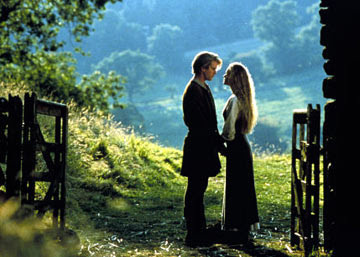 And, speaking of Cary Elwes, perhaps the ultimate 'sick day' movie in the Curmudgeon house when the kids were little was The Princess Bride. I think every one of my kids, to this day, can recite large portions of dialog from this movie on command. I thought about putting this movie on myself when I was home early at the end of last week. After all, this was an opportunity for me to watch anything I wanted. I could even watch some Monty Python, I thought. A couple of years back Long Suffering Spouse gave me every episode of the Monty Python TV series in a boxed set. I love Monty Python. But Long Suffering Spouse hates it. And, I thought, if I put that on, I'll doze off peacefully... but I'll pay for it when Long Suffering Spouse gets home. What? I suppose you'd have picked out something by Ingmar Bergman? Or Akira Kurosawa? Long Suffering Spouse and I were conversing over nothing, really, as we were getting ready to plunge into the day yesterday. Familiar topics were predominant: How tired we were, how late we were, how much we both have to do. Then Long Suffering Spouse brought up a story she'd heard on the radio while I was off shaving: "I heard that, if forced to make a choice, more than a third of married people would chose their BlackBerrys over their spouse." I mulled this over for a second or two. "I suppose, then," I ventured in response, "that I should not ask for a BlackBerry for Christmas." "No," agreed Long Suffering Spouse. "But maybe you should get me one." Wall Street has been bailed out again, this time with the G taking over AIG. Freddie Mac and Fannie Mae were rescued -- what -- two weeks ago? Not even? So... what do our presidential candidates have to say about it? If I understand the soundbites correctly, Senator McCain says he'll appoint a commission to look into what happened and tighten regulations to make sure it doesn't happen again. Senator Obama says the problem is "leadership." It's just another failure of the Bush Administration. Nobody is talking about sending anybody to jail. Now come with me, for just a minute, on an imaginary journey. We are in a law library now. On your left you will see volume after volume of statute books. I'm pointing you toward the maroon volumes of the United States Code Annotated. See the shelves groaning under the weight of these books? Now look over there: Row after row of volumes entitled Code of Federal Regulations (CFR) for short. These are the regulations promulgated by federal agencies under authority granted them by those Acts of Congress set out in the U.S.C.A. Isn't it amazing how much room these books take up? Those of you who own homes: Think back to when you bought your house. In many U.S. states you may not have the services of a lawyer, but in all states you had large piles of paper to sign because (unless you're Bill Gates) you took on a mortgage along with the house. Most of the paper you signed had to do with those loans. A lot of those papers are prescribed by some of those statutes and regulations we were marveling at a moment ago. That's why you may have had to sign a separate closing statement and a RESPA or HUD-1. That's why you signed a disclosure statement that said how much interest you'd pay on the loan, assuming you made all your payments just as they were due and just in that amount. (Wasn't that a big number?) That's why you signed a new loan application, detailing again all the information you provided your lender. I don't do real estate closings for a living. I do them occasionally, basically when forced to because of friendship or family obligation. But even I know that misrepresentations on many of these documents constitutes a federal crime. Right now. Without need for a commission. Without need for greater "leadership." Our current mortgage crisis isn't the result of unfortunate circumstance. It is the collapse of a house of cards. Lenders, mortgage brokers, appraisers and, yes, even some lawyers, conspired and colluded to 'flip' properties to straw purchasers to drive up prices, to skim money from transactions, to kite appraisals, to put people into loans they had no chance of ever repaying. Banks looked the other way on these -- lending money on fraudulent transactions because the bank knew it would sell these stinking loans as quickly as possible. Dubious debts were bundled together and rechristened as securities (talk about putting lipstick on a pig!). And the financial houses that have collapsed in recent weeks have been the last ones holding this paper. You want to restore confidence in the financial system of this country? Start prosecuting the bums who engaged in this conduct. Loudly. Publicly. Every night on the TV news announce a new indictment. Let's do what they do in political prosecutions: Offer deals to the lower level players who can provide solid evidence pointing up the chain. Let it be known that the first guys on the Federal bus will get out of jail soonest... or maybe even get probation. But our presidential candidates -- neither of them -- call for this. And Wall Street, whimpering now, cowering, is already dreaming of when next it can sneakily sink its fangs into the necks of the American people. Because Wall Street sees that, once the crisis is past, it will be back to plunder as usual. Welcome to this week's edition of Heads or Tails, the meme brought to you each Tuesday by Barb, of all things Skittles, who, this week, has poked a particular sore spot in the Curmudgeon's hide. I'll get over it. But, first, I'll explain. In the course of more than a quarter century of married life, Long Suffering Spouse has chosen to overlook most of my many faults. (Thus... "Long Suffering.") However, from time to time, my inability to cook has chafed, just a tad. Part of it is that I don't much care for food. I eat, obviously, when necessary -- and even, judging by my substantial girth, when not entirely necessary. But I am not a "foodie." I don't care what spice is here, or what herb is used there. If it tastes good, I'll eat it. I won't ask questions. And I really don't want to know. On the evening news sometimes, rather than investigate who's profiteering from skyrocketing gasoline prices (for example), the news editors will provide a restaurant review. The reviewer will gush over (and display pictures of) teeny tiny portions of pigeon meat, set atop a brillo pad and covered by a contrasting carmelized ooze, resting next to a little dollop of white turnips or a slice of some vegetable I've never heard of. (Which is most of them.) The foodie reviewer seems to award more points for bizarre, inedible combinations. I am repulsed always. Long Suffering Spouse is repulsed only sometimes. If I were hungry enough, and if this junk were presented in a casserole or stew pot, I might eat some. As long as no one told me what it was. But to get a big plate with only a little on it as some sort of "presentation" is a visual cue for me: I can't eat it. I wouldn't on a bet. Fortunately (for me) Long Suffering Spouse is an excellent cook and a better baker. And she (usually) enjoys it. I can keep her from getting too upset with my lack of culinary skills by scrubbing the occasional pot and pan. And, if worse comes to worse, and if disposable income permits, I can dial for a pizza with the best of them. But I don't do recipes. This has actually happened to me, however, many times. We officially had more rain here in Chicago in a single 24 hour period (Saturday) than at any time in our history. We were going to get a soaking anyway... but the residual moisture left over from Hurricane Ike amplified matters. And speaking of soaking. Last week, before Ike, gasoline prices in many parts of Chicago had slipped below $4 a gallon. A Citgo station in Niles was down to $3.92. As I told Youngest Son as I filled up our car on that occasion, the human spirit is remarkably adaptable. We can exult at being gouged for $3.92 for a gallon of gasoline when only a year ago we would have been searching for torches, pitchforks and tar at the very thought. Then the Weather Channel began broadcasting minute by minute updates of Ike's progress in the Gulf of Mexico. It is true that a large portion of the gasoline refining capacity of the United States is concentrated in the Gulf region. It is also true that the refineries had to be powered down and secured in anticipation of the storm. Common sense and elementary economics suggests that these actions would, eventually, have an impact on prices. Within a day of filling up for $3.92 a gallon, that same station posted a new price: $4.09. Nor was it alone. Nationally, gasoline prices allegedly went up seven cents in a single day (an increase of 17 cents between Friday and today, according to MarketWatch). In Chicago, though, gasoline prices went up far more. At this one station, it went up 47 cents in the week. That $4.09 went to $4.29 and then to $4.39 on the next day. Most of this occurred before Ike hit and all of it occurred before any possible damage to the refineries could be assessed. But, of course, everyone concerned denied any price gouging and the populace seemed accepting of these bland reassurances. And there's good news! Reuters reports this morning on Yahoo! News that crude oil prices have fallen significantly because Ike didn't do nearly as much damage as was feared and because, in the latest fallout from the mortgage crisis, Lehman Brothers has filed for bankruptcy. And here's the best part -- at least if you're a multimillionaire CEO in the banking or energy industries -- no one seems to be getting indicted. Somehow, though, I don't feel like celebrating. During this silly political season many people are quick to assert that Candidate X is trying to impose his or her religious views on an unsuspecting public. These accusations usually... but not always... come from the Angry Left about candidates from the Red Meat Right. These accusations usually come flying in with a companion accusation that Candidate X is trying to subvert the Constitution. Let's talk about that, for a moment, calmly, if we can, and without naming candidates or calling names. Most laws spring from a moral code of some sort. The connection is particularly obvious with criminal laws. This does not mean, however, that laws against theft are unconstitutional impositions of someone's religion on the body politic. Please note that I do not pretend for a moment that some aspects of some Sharia codes... such as allowing anyone to kill an apostate -- i.e., someone who has converted from Islam... would be anything other than hopelessly unconstitutional. In such a case the civil authority would be clearly invoked in support of a particular religion. On the other hand (*ahem*), in our theft example, although the new law would specify a penalty advocated by a particular religion, it would not require everyone to become a Muslim and would apply equally to Muslims and non-Muslims alike. Now, let's move to a more controversial topic: Legalized abortion. Don't retreat to your prepared trenches just yet: Stay with me for just a minute more. Some candidates seek restrictions or even outright bans on abortion except in the most limited of cases. This is consistent with the teachings of some, but not all, Christian churches. This does not mean that candidates who espouse such views are trying to subvert the Constitution or establish (for example) Roman Catholicism as the national religion. You may disagree -- and disagree strongly, even passionately -- with persons who would seek, through legislative and judicial avenues, modification of the laws which currently permit abortion. But such persons are not (necessarily) trying to subvert the Constitution (again... no categorical statements) by working to change a Supreme Court precedent. Working to change a precedent of the Supreme Court is not trying to 'shred the Constitution.' Supreme Court precedents are neither immutable nor immortal. See, for example, Dred Scot v. Sanford, 60 U.S. 393 (1857), or Plessy v. Ferguson,163 U.S. 537 (1896). Now, then. If we can agree on this much, we are way ahead of the "debate" online and in the media. We may even be able to have an intelligent discussion about this issue. But this is enough for one day. Well, maybe not the plague. Maybe it's just a bad case of the sniffles. Youngest Son brought it home from football practice. Long Suffering Spouse succumbed next. I have to go out of town for court on Friday. Today's Wednesday. I'm popping aspirin like candy. Because, as everyone knows, aspirin cures everything. Except that which is cured by ice. For really serious conditions, take aspirin and ice. For desperate conditions, add chicken soup. That was Long Suffering Spouse's dinner choice yesterday. I think it will be mine this evening. Youngest Son, by the way, already feels fine. But he's looking at us warily... afraid he'll catch it again before his game Friday night. The newspaper industry has been dismissive of blogging -- perpetuating the stereotype of the unshaven loser, sitting in his underwear, screaming anonymously at the world from a keyboard in his mother's basement. Of course, it seems that recently even the most stodgy newspapers have set up blogs for at least some of their reporters or columnists with blogs. The Chicago Tribune Washington Bureau has a blog, The Swamp, that I wind up visiting most every day. So the line between blogging and reporting is blurring... or is it? I submit that there is still a clear distinction, one which depends on what the writer does, not how the piece is written or where it appears. A good analogy to one typical sort of blog entry is an op-ed column in a newspaper: The columnist comments on some event, assuming the reader will have gleaned the news about that event from some other source... preferably (from the newspaper's view) the news hole of said paper. Not all columnists blog... and most columnists do not blog all the time. Robert Novak, for example, generally reports on a story as well as comments because he cites his own sources. He doesn't merely repackage quotes obtained by some other reporter. Jay Mariotti, on the other hand, who recently quit his Sun-Times column, was derided, after his departure, by his former colleagues as little more than a blogger since he took quotes they gathered and merely added his (almost always negative) views. First person observations may or may not be reporting: Watching the parade pass through town and counting the floats might be reporting... but probably isn't. If the writer adds, accurately, that the sophomore class float again took top honors, the piece becomes more like reporting. Closer still if the writer accurately recounts a chat with the parade organizer who provides statistics about the number of floats or the effect of the change in the route this year. Welcome to this week's edition Heads or Tails, the Tuesday meme brought to you by Barb, of all things Skittles, who always encourages participants to think outside the box. And today's topic is box. A box is a thing your little kid plays with, ignoring the expensive and/or educational toy inside. A box is the thing you put stuff in that you're not quite ready to throw out but can no longer stand to look at. No matter how long ago you moved in, one box still remains unpacked. If you unpack it, you'll have to move again. If you have two boxes, and you need something from one of them, it's in the other box. No matter which box you search through first. If you have a stack of boxes, and you need something from one of them, that thing is in the box on the bottom of the stack. A box of old junk can be like a bottle of fine wine: Practically garbage when it is first stored... but years later it may yield a treasure. Youngest Son is driving every morning to school now, slowly but surely amassing the 50 hours of parent-supervised driving practice that he must accumulate before he can acquire his driver's license. Actually Youngest Son is doing pretty well at this student driver thing; I seldom scream in panic more than once a trip these days, and usually because of something some other dunderhead is doing in front of us -- pulling into traffic without looking, changing lanes without looking, entering an intersection without noticing that the light has turned red.... Look out! LOOK OUT! And what can Curmudgeon and his Youngest Son agree to listen to together? Sure, it's a cliche: The Old Man and The Kid don't have much to talk about or say to each other but can find common ground in the world of sports. This didn't get to be a trite image because it was unusual. There are two sports talk shows on morning radio in Chicago, and we've flipped back and forth between them both. Mike and Mike on ESPN Radio almost never takes calls from listeners. Mully and Hanley, on WSCR (the Score) almost always do. I can't stand the call-ins. Oh, sure, some of them might be intelligent, articulate, knowledgeable. Most appear, however, to be drooling idiots. And these are the ones who get past the producer screening the calls. The ideal sports show, in my opinion, would limit its guest list to sportswriters... which was pretty much the format of Tony Kornheiser's ESPN show a few years back. I don't even care for most of the interviews with athletes. The ability to carry, catch or swing at a ball does not necessarily carry with it a glibness in the English tongue. Or even fluency. So Youngest Son and I are having conversations on the way to school about sports, about sports radio, about how his fantasy football teams did this weekend. This leads to conversations about his football practices this week and -- sometimes -- even two or three word answers about his grades. And, on the way home, I get to think about whatever I want. And drink my coffee. And curse freely when some idiot changes lanes without signaling... because Youngest Son isn't there to pretend to be shocked by my language. I was trying to make a deposit at my downtown bank before the teller windows closed. "Bankers' hours" -- the genteel, late-starting, early-finishing schedule of plump-looking small-town giants, wearing suspenders and a carnation for a boutonniere -- are relegated largely to memory in this day and age of banks in grocery stores and discount stores that are open seven days a week. Except, ironically, in the big city centers. At least in downtown Chicago, most of the banks, and all of the big ones, seem to close at 4:00 p.m. So there's something of a rush at 3:30 or so and I was in that rush, stopping at the office only briefly after a morning in court in the 'burbs, on my way to another appointment, and grateful that I'd made it to the bank on time. There are two teller lines in the large lobby of this proud downtown bank. Downtown square foot real estate values being what they are, even in our troubled times, the lobby of this venerable institution is about to be downsized. For now, though, and perhaps only a few weeks longer, the lobby conveys a sense of power and wealth and no-nonsense common sense that all banks used to convey. Before no-principal (or should we say unprincipled?) mortgages. I quickly scanned the teller lines when I got inside. There are more teller stations on the east wall of the lobby, but there were several people waiting in line. There were only two stations open on the north wall, but only one person waiting in that line, and it was obvious that a third window was about to open. To accommodate that 3:30 rush, you see, now well underway. I jumped in the line for the north wall tellers. Two other men were right behind me: a relatively nondescript middle-aged man, except that he was taller, thinner and had more hair than me, which almost certainly accounts for my harsh initial assessment, and a white-haired leprechaun in a blue suit. Think Lou Holtz. A scrawny bantam rooster with the map of Ireland on his face and twinkle behind his glasses. The person ahead of me was now at a window and I was next in line, and the third window opened up. I started over, but as I drew near someone behind the counter called the young lady teller away from the window: She practically shut the window in my face. I did a double take and returned to the line. The men behind in line caught the gesture and laughed. "What's the matter?" asked the nondescript man. "Isn't your money just as green as anyone else's?" "Well," I said, "they know me here. They've seen my checks before." "They can't compare to my checks," said the leprechaun, and the three of us proceeded, for the next minute or so, to poor mouth our own respective financial conditions. It was an inspired moment of improv comedy. Except that this has been only a four day week. I had Monday off, though I was in the office for a couple of hours -- probably longer on Monday than on Wednesday. Why is it that "short" weeks often seem so long? Do we channel appointments, events, big plans to the "short" weeks thinking that, with the extra day, we'll have the stamina to get through them? I am sure I could come up with a plausible-sounding theory about it if I stopped and thought about it for awhile. Except I'd probably fall asleep first. So instead of coming up with something on my own, let me resort to an irregular feature of this very irregular blog... the Unscientific Survey: Do you, dear reader, find that "short" weeks seem longer oft-times than "regular" weeks? And -- if so -- do you have a theory as to why? Seriously, I have always read voraciously -- but no one ever forced a summer reading list on me as a child. My own children have not been so lucky. And every year we have a battle. I bought Youngest Son his required book early this summer. I placed it before him on almost a daily basis. I reminded him of it at every opportunity. I begged, I pleaded. I threw it at him a couple of times. He did do better this year than last, though: This year he didn't have to stay up reading all night before the first day of school. He didn't finish until the last minute, though. And what else did Youngest Son read this summer? Sometimes he'd browse the Sports section in the paper. He'd look at Sports Illustrated. But a book? Never. Nor is he the only one of my children to do this. In fact, with the exception of Older Daughter, none of my five children ever, ever reads books for pleasure. I don't remember whether Older Daughter had books assigned for summer reading (although I think she must have in high school). Certainly, though, all of the other ones have had summer reading assigned. I see cause and effect here. Summer reading takes one of life's pleasures -- reading -- and, for most kids, turns it into an odious, resented chore. Maybe because it requires kids to think about school in the summer. And who would like that? Because my children have all attended Catholic schools, they've been required to perform "service hours." Like summer reading is supposed to inspire reading for pleasure, service hours are supposed to turn kids into the next generation of volunteers. That hasn't worked either. Not with my kids. But that's an heretical thought for a different day. Sarah Palin was thoroughly vetted. That's the contention that the McCain people are making in the linked AP story by Beth Fouhy and Liz Sidoti, posted this morning on Yahoo! News. That's the only real import of the Bristol Palin story -- what it says about John McCain. If he knew, and picked Palin anyway, it would have been a gutsy decision. And the Democrats would be wise to follow Senator Obama's lead on this and stay away from it. If he didn't know, and if Gov. Palin knew but wasn't asked, that would say something completely different. About both McCain and Palin. If McCain didn't know and if Gov. Palin didn't know either -- that says something about the sacrifices one makes to walk on the public stage. I suppose we'll never know for certain that we have the true story, though. McCain and his senior people have to publicly proclaim that they knew all about Bristol Palin's pregnancy. Even if they didn't. One hopes that -- if VP hopeful Sarah Palin knew -- she in fact disclosed it. But teenagers aren't always as forthcoming as we parents hope... and Gov. Palin has been distracted of late. Running a state (even a small one), a special needs infant, and a chance at national office? That's a lot to juggle. Maybe the teenage daughter had kind of dropped off the maternal radar. So maybe McCain didn't know because Gov. Palin didn't know either. You can bet your last dollar that some unnamed person 'high up' in the McCain campaign will whisper bitterly to a reporter that the campaign was not told in advance. I'm thinking such a story will be running tomorrow, if not by this evening. That might be because it is true... and it might be because this person was hurt at learning he or she was not 'in the loop' for this information. There's a lot that this unfortunate story might tell us about Senator McCain -- but since we can never be sure of anything that's said about it, we'll just have to watch and see what the parties do going forward. Maybe that will tell us what we need to know. And by parties... not the kid. Or her boyfriend. Let us all hope they can be left alone by our voracious media. Welcome to Heads or Tails, the weekly meme brought to you on Tuesdays -- even on Tuesdays that feel and behave very much like Mondays, like today -- by Barb, of all things Skittles. Curse you (again), Mr. Gates! You may have wondered, if you're surfing the 'net while waiting for the coals to be ready on this fine Labor Day, what the heck Curmudgeon is posting for. After all, I almost never post from home. Nor am I posting from home today. I'm here at the Undisclosed location because -- I thought -- Mr. Gates wanted me to install a new 'Service Pack' on my computer here. I thought this because I found one of those scary yellow shields in the lower right hand corner of my screen, over by the clock, on my computer at home yesterday. I spent more time fiddling with it that I bargained for, and of course I had to restart the machine. Restarting the computer here at the Undisclosed Location is at least a half hour proposition. So, I thought, brilliant strategist that I am: I will go to the Undisclosed Location on Labor Day and take care of these housekeeping matters when the phone is not ringing and I don't have to be in court. Except, of course, that the little yellow thingy is not on the machine here. Curse you, Mr. Gates! I suppose I could go to the Microbrain Updates Page and find it... but, no, I got distracted by stuff in the weekend mail. And then I thought I'd write a post that I'd thought about writing this weekend. Now it's time to go home and start the grill myself. If you ever want to know what the media bias is, all you have to do is listen to my mother-in-law. She doesn't watch Fox. So she's all agog that Gov. Palin has no foreign policy experience and how poorly that contrasts with Sen. Obama's inspired pick of Joe Biden. Well, yes, Abuela, Long Suffering Spouse explained to her mother, but Obama doesn't have the foreign policy experience and that's why it made sense for him to choose Sen. Biden. On the other hand, she explained, Sen. McCain is campaigning on his own experience. So it doesn't matter if his running mate has foreign policy experience or not. The foreign policy red herring will swim by in a moment. The Democrats really hope to brand Gov. Palin as a female Quayle. Fairly or unfairly, George H.W. 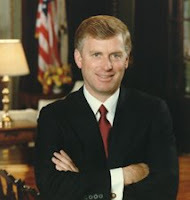 Bush's Vice President, Dan "Potatoe" Quayle, was perceived as a lightweight by the American people. Whether Gov. Palin will prove to be a Quaylette will ultimately depend upon how she comports herself in the coming campaign, not how she is spun by the talking heads on cable news. But she does have one thing going for her: As an elected Governor she actually has executive experience... something no other candidate for national office has. Granted, the entire State of Alaska has only around 683,478 residents (a 2007 estimate, per Wikipedia). By contrast, DuPage County, Illinois, a traditional Republican stronghold just west of Chicago -- just one of the six counties that together make up the greater Chicago metropolitan area -- has over 900,000 residents (again, per Wikipedia). And Palin has only been governor for less than two years. But that's still more executive experience than Senators Obama or Biden have: Obama went to the U.S. Senate from the Illinois State Senate; Biden went to the Senate from the County Council of New Castle County. That's also more executive experience than Senator McCain has: He did command a Naval Air Unit, VA-174, from July 1976 through July 1977, but aviators don't typically command large groups of personnel. He was never a ship handler. And command in the military is somewhat different than holding an executive political office. OK, a lot different: In politics, one seldom salutes... someone might see the knife up your sleeve. We Americans keep talking about "experience," as if this were really important. If "experience" -- time in office -- is all that matters, Dan Quayle should have been four or five times the candidate that Sen. Obama is. I don't think that even the most militant Republican would make such a contention. I think what we're really craving is gravitas, and maybe dignitas. Brains are wonderful to have... but brains can be bought. We really are looking for wisdom.